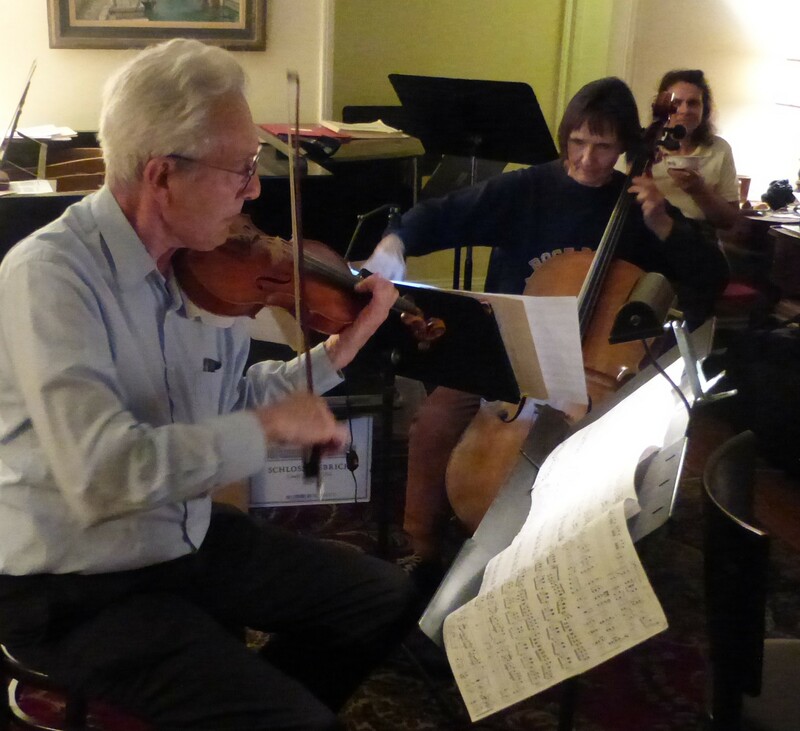 A few years ago, at the invitation of Janice's longtime friend, pianist Dan Brodsley, Dr. Foy had the unique opportunity to attend a music party with Dan's friend of many years, the amazing 1st violinist from the Guarneri Quartet, Arnold Steinhardt. This photo reflects a bit of that enjoyable time while the "Duo" sightread lots of great music. Enjoy the sound clips which are also included on Dr. Foy's site. Pictured are the "2 YoYo's" - as Doc Foy would say. 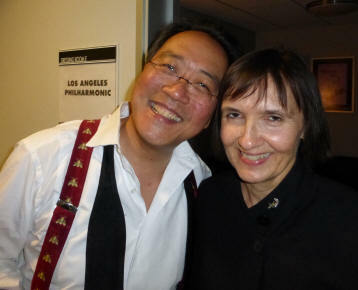 Janice so enjoyed reconnecting with her friend Mr. Yo Yo Ma back in 2014, after his Hollywood Bowl concert. 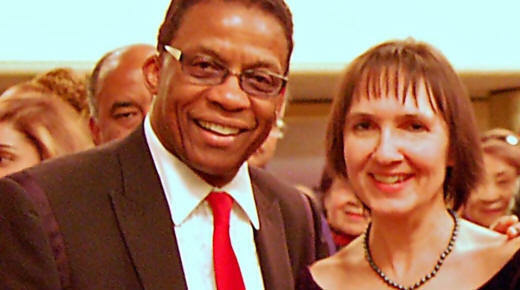 Janice will never forget the wonderful moment of "utter amazement" when Herbie Hancock walked from the audience up to the stage in Santa Monica's SGI Center, to join her New American Quartet in a performance for a World Peace concert, in 2008. Her quartet will forever keep that afternoon with Mr. Hancock in their memories! As an Ethnomusicologist I have experienced the rich treasures of music all over the globe and enjoyed collaborating with fellow musicians in all types of venues and countries. As a teacher I look forward to enriching more lives with my expertise as a ‘cellist/pianist and hope my students will then pass on what they have learned to others. Finally, I hope that as a performing artist I will help with others in my field to create what the world needs now: hope, peace, and love for all. Music is the ultimate healing solution to all of humankind’s problems. 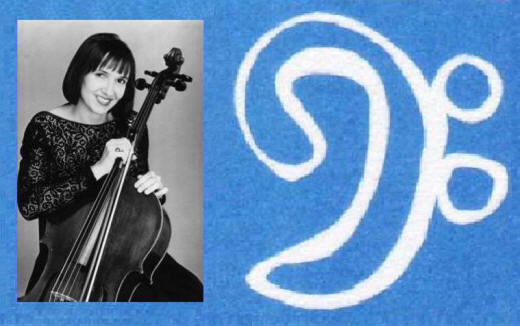 Called a 'gem of a ‘cello coach' by actor Samuel L. Jackson, Montana-born 'cellist & pianist Dr. Janice Foy, shares her gifts through performance & teaching. She received special "Commendation from City Hall" for having championed American music globally, reflecting her goodwill tours abroad, multi-ethnic collaborations with Koreans, Croatians, Romanians, Germans, and Polonia, in addition to a Command Performance before HRH Prince Bandar Bin Sultan, 2003. Additionally, Dr. Foy has recorded music for and appeared on "Friends", "Seinfeld","Alias", Disney’s “What about Brian?”, consulted for "ER", and served as a guest artist/lecturer on radio stations plus college campuses. Her New American Quartet premiered the George Washington Quartet instruments to a sell-out crowd at Forest Lawn, Hollywood Hills through the Glendale Symphony. Dr. Foy's interest in educating young people continues as she has had several after-school string programs in addition to having done many school assembly concerts in the Los Angeles Unified School District & Glendale Unified School District, throughout the years. Outside of the school venue, Janice ventured to hospitals & special needs centers bringing music to patients not able to create their own joy, in addition to entertaining seniors at Westminster Gardens & the Westside Jewish Community Center. For UCLA's Neuropsychiatric Institute, Dr. Foy & her colleagues performed for the Semel Institute's Lunch Hour Concerts. Dr. Foy has served as Principal ‘cellist in various orchestras, including: the West L.A. Symphony, under various conductors including Angel Romero; the Korean L.A. Pilgrim Orchestra under Maestro Jae Lee; the Pacific Pops Orch. under Shelly Cohen; & the Southern California Philharmonic Orchestra, under Maestro Jae Kyung Lee and Center Stage Opera. Currently she is Principal ‘cellist in Symphony 47, under Maestra Eimear Noone. She combines orchestral leadership roles with her chamber music activities while offering private lessons for both ‘cellists and pianists of all ages and abilities. Dr. Foy has also coached several local Youth orchestra ‘cello sections, including CSUN’s Youth orchestras, under Dr. Roscigno. Janice earned her BA & MA in Music, ‘with Distinction’, from California State University, Northridge then in 1990, she received a Ph.D. in music from UCLA, where she specialized in Ethnomusicology. As founding Director of Bravo! L.A., an umbrella organization for her ensemble and solo projects, Dr. Foy offers a treasure trove of string music for the Los Angeles area in a multitude of styles for all of life's occasions from weddings, to birthdays, to memorials! Many of the CDs on this site feature Bravo! L.A. musicians. Just send me an email if you want to order 1, 2 or all of them! Dr. Foy recorded the music of Lalo Schifrin for the Jackie Chan movie, Rush Hour 3 at Sony and Fox studios, just before the Glendale Symphony died. The orchestra consisted of freelance musicians mostly from the GSO and some from other orchestras, plus an impressive array of virtuosi percussionists who added an exciting flavor to this Rush Hour series. It was a remarkable musical endeavor - in fact, Lalo Schifrin was a favored conductor of the Glendale Symphony (where I had tenure!) & we all hope one day the orchestra will come back to bring such performances as we had with the Three Tenors, and of course my favorite, with the late Luciano Pavarotti. All sell outs! Unfortunately, due to financial issues, the orchestra is no longer active, but I hope as we all do, that it will flourish again sometime in the future. Collaborating with the great Yo Yo Ma for his Wadsworth solo ‘cello recital in 1994 was a day Dr. Foy will cherish forever. Professor John Hall, from UCLA, asked her if she would like to give the pre-concert lecture for Mr. Ma’s recital. She accepted the invite and all of this happened following the ’94 earthquake and her dad’s stroke. Unexpectedly she also got to play Mr. Ma’s 'cello as he requested to hear the acoustics of the hall. It was a fabulous experience for all and Dr. Foy appreciated the graciousness of the great Yo Yo Ma. This past summer Janice reconnected with Yo Yo after his appearance at the Hollywood Bowl, in 2014. He remembered her after all these years! Dr. Foy hopes she will have more opportunities to work with Mr. Ma. Janice performed under the baton of Angel Romero with Canadian Brass trumpeter Jens Lindemann, '08 as Principal 'cellist with the West L.A. Symphony. She was the featured orchestral delegate for Asso. California Symphony Orchestras, '06 when she represented the Glendale Symphony. Dr. Foy won an N.E.H. Affiliate Grant for her research on the "Mozart Effect" with two lecture-performances: Baldwin Performing Arts Center & the CSUN Performing Arts Center. Janice was the 'cello soloist on the newly recorded Glendale Forest Lawn's Death/Resurrection music, '07, with the Masters College orchestra. A few years later, Dr. Foy was invited by Kaiser Volunteer Services to present her research on the music and brain connection in downtown LA. In the Jazz field, Dr. Foy has performed on piano with the Happy Band, directed by Douglas Autrey; the Westside Jazz Kats headed by trumpeter Leon Wesley; the World Peace Orchestra as 'cellist, directed by guitarist Bill Skinner & more recently as pianist with the Harold Kaye Dance Band. (Mr. Kaye passed away in 2015 and we all send our blessings to this wonderful man.) Along the 'jazz' theme, Doc Foy collaborated with the great Bennie Maupin and his Ikeda Kings Orchestra in a special concert with Grammy winning pianist/composer Herbie Hancock. Her string quartet, the New American Quartet joined in the concert and both received enthusiastic standing ovations. Truly this was a unique experience for all in 2008. The concert took place at the SGI Center in Santa Monica for their World Peace concert. In the summer of 2013, Dr. Foy was able to organize a new group of 8 ‘cellists using her original name of Cellissimo! L.A. She organized the new version of Cellissimo! L.A. to perform with the outstanding vocalist, Hope Foye, whom she met while at a friend’s concert. Janice continues to be connected with Hope, as best she can, despite the large distance geographically with her in San Pedro. The event at the Mayme Clayton Library/Museum was a huge success and it actually marked, to the day, when Hope had performed the same work, Aria by Villa Lobos, with Pablo Casals’ very own ‘cello ensemble, 50 years ago. Hope was unfortunately black-listed during the McCarthy era and was forced to pursue her vocal career outside of the United States. She became a highly successful singer and coaches young singers today, even at the age of 94! Janice thoroughly enjoyed her Principal ‘cellist spot when performing with the great singers in the Center Stage Opera company. The talented singers were always remarkable and every so often they would bring in guest singers from the MET. Dr. Foy serves on the Symphony 47 Orchestral Board and was one of the founding members of Symphony 47, back in 2011. They are currently waiting to put up their Kickstarter video and then fundraising will begin so they will be able to give their first concert in 2016, to be presented at Local 47, their home base. Dr. Foy is the External Orchestral Liaison and their Principal ‘cellist. Janice performed with Robin Geselowitz, guitarist, for the Center for Early Child Education in West Hollywood, for their special Christmas concert or Winter Sing, on December 18, 2015. At the recommendation of Dr. Foy's talented harptist friend Heather Jenkins, she put Janice in touch with Robin to create a unique Duo for the CEE's Winter Sing concert for 2015. It was a rousing success! Janice looks forward to more collaborations with the talented faculty of CEE in the years to come. Starting out the New Year, 2016, Janice will be forming a new ensemble, Joyful Spirits, that will be a string group with optional piano. In other words, out of this group, there could be a string duo, string trio, string quartet, etc., and all of these could be joined by a wonderful pianist, such as Louise King! Janice would love to hear from those interested in doing collaborative concerts in Jazz, Classical, Baroque & multi-ethnic musical styles. See<?fontfamily><?param American Typewriter><?bigger><?bigger><?bigger> Flamenco Fire!<?/bigger><?/bigger><?/bigger><?/fontfamily> Solo 'Cello/Flamenco Dancer Duo featuring<?fontfamily><?param American Typewriter><?bigger> Jani Quintero<?/bigger><?/fontfamily> as she dances to<?fontfamily><?param American Typewriter><?bigger> Ennio Bolognini's "Echo Serenade",<?/bigger><?/fontfamily> for solo 'cello performed by <?fontfamily><?param American Typewriter><?bigger>Janice Foy<?/bigger><?/fontfamily>. Videography by<?fontfamily><?param American Typewriter><?bigger> Konrad Wilk<?/bigger><?/fontfamily>. Mayumi's Birthday! This is an 'East European Medley' which includes: Serbian tunes - "Tamo Daleko" and "Ima Dana" followed by the Croatian tune "Jos Nijedan Zagorec"; then "Oci Cornije," a Russian tune; followed by a Hungarian Csardas, "Moja Mala Nema Mane." Janice put this medley together of her favorite tunes, following her many trips to various parts of Eastern Europe - before and after Croatia gained its independence. Taiwan Ballads’ Suite for Erhu and ‘Cello Duo, Arranged by Steve C. Chiu World Premiere! This performance represents the first time Steve Chiu and Dr. Janice Foy have collaborated together! Mr. Arnold Steinhardt, 1st violinist from the now retired Guarneri String Quartet Janice was invited by a mutual friend, Mr. Dan Brodsley, pianist, to sightread through some duos with the visiting artist Mr. Arnold Steinhardt, who was the first violinist from the Guarneri String Quartet. This is a portion of the Ciacona's Andante con moto section (on a theme of G. Fr. Handel), by Prinus Dietze, 1910. This is the Bohuslav Martinu Violin Duo No. 1, 1927, and the clip here starts about halfway through the Preludium and goes up to the first few bars of the Andante section. Here is a clip that begins at the end of the Preludium, around the beginning of the Andante section where we left off before, and then the clip goes all the way to the end. It is funny and actually great that Mr. Steinhardt says, "very strange" at the very end. How appropriate a comment he made, even in this day and age! We hope you enjoyed our sight reading party and I look forward to doing this again with other duos, and collaborating with the great Mr. Arnold Steinhardt! He was a joy to play with and I hope he had a great time as well. Thank you Arnold!!! Janice's new ensemble, Soulful Strings, was one of several groups featured in the Los Angeles Violoncello Society's Ensemble program, February 12, 2017 at the Crossroads School Community Center. The group performed the Taiwanese Ballads Suite for Erhu and 'Cello Trio, arranged by Steve Chieh-Wei Chiu. 6 famous Taiwanese folk songs are featured in this Suite: The Moon Represents My Heart, Sijihong, Spring Breeze, Jasmine, Diudiu Copper Aberdeen, and Happy Chinese Year of the Rooster. Steve and Janice performed this same piece, but as a Duet for Erhu and 'Cello, for the 2016 Chinese New Year program for the CSUN China Institute, Year of the Monkey! Sesun Park studied 'cello at the Music College of Sook-Myung University in South Korea, and she studied with Eleonore Schonfeld in Los Angeles. Sesun became Professor of 'cello at Sook-Myung University, and she was a member of the Seoul Philharmonic Orchestra for 18 years. Sesun performed at the 14th New Musician Performance which was held by Cho-Sun Il Bo newspaper, and soloed with the Seoul Philharmonic Orchestra for the 25th Anniversary of Sook-Myung University. Recently, she became a member of the Pasadena Community Orchestra, and she is Principle 'cellist of Crown City Symphony. Sesun joined Symphony 47 in October of 2016. Cordis Gilliam was Principal 'cellist in the Redlands Community Orchestra, prior to coming to Los Angeles. He taught himself how to read music from his Yamaha keyboard and hasn't stopped playing music since. His favorite music is that of Mahler, Tschaikovsky, and the Mozart Requiem, in particular. In January of 2016 Cordis joined Symphony 47 and he hopes to one day record music for motion pictures. Steve Chieh-Wei Chiu is a professional violinist and erhu player, composer and conductor. Mr. Chiu received degrees in Film Scoring when George S. Clinton was the Chair, at the Berklee College of Music. Mr. Chiu's music and performances have been recognized in many places, such as in films, TV, documentaries, and theaters, throughout the USA, Taiwan, and China. Dr. Janice Foy, is doing a solo 'cello rendition of Steve Chiu's Taiwanese Ballads Suite during the 2017 Chinese New Year's party at Michael Chiang's place, son of her good friend Agnes Chin. This first movement is called, The Moon Represents My Heart. Michael's friends are also heard humming/singing in the background. Movements 2 - 5 of Steve Chiu’s solo rendition of his Taiwanese Ballads Suite. Dr. Foy continues Steve’s Taiwanese Ballads Suite with movement 2 called Sijihong. This is followed by movement 3 called Spring Breeze along with the famous Jasmine tune. The last two movements are very uplifting and fun. Movement 4 called Diudiu Copper Aberdeen, gets the audience laughing a bit and the final movement, Happy Chinese New Year really gets the crowd going and at the end, their enthusiasm and the tune’s energy literally lifts Doc Foy out of her chair! Great job Steve - your Suite is a winner no matter what “combo” or solo instrument plays it! Chinese New Year Celebration for Year of the Rooster, 2017, Continues! The Jasmine song, which was performed with a mixed ensemble and singers, now features Janice on 'cello, with Dr. Michael Chiang and Agnes Chin singing the Jasmine song. Michael is her son who is a doctor at UCLA. Agnes and Janice did concerts in the 1980's at UCLA in the Ethnomusicology department. Agnes came from Taiwan about 32 years ago and they reconnected when Agnes invited Janice to celebrate her “Leo” birthday along with her son Michael’s birthday, in August of 2016.